I was asked how I dealt with doubt. How I dealt with writing something and then thinking it’s pants and wanting to abandon it. What should you do? How do we deal with doubt? Well, self-doubt is another part of process, trust me — and before we start having regular acceptances and even when we do, we all doubt in our ability. We might have friends, writing groups etc.saying this is great but nothing we do finds the work the validation we seek and it’s tough. So there is doubt in a general sense and since rejection is part of process all you can do on that one is to keep writing and keep getting advice — and keep writing. 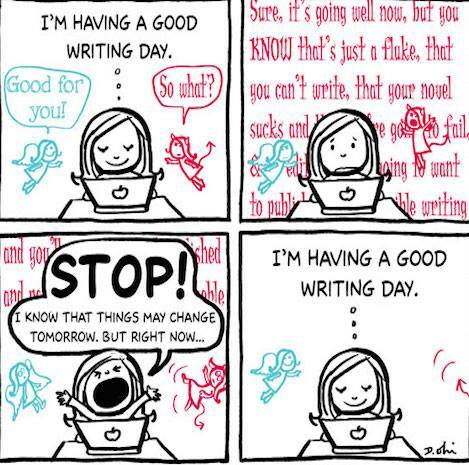 Oh and keep writing. Work through the doubt much as you work through the pain of exercising on top of aches and pains from yesterday’s exercise! It does get easier as you shape up the muscle! But how about when you are in a project, something like a novel that seems to be going well and then you think — this isn’t working. Start over? It’s a hard one. I don’t tend to abandon short stories or novels, but I do leave them to rest if they really don’t feel as if they’re working, right now at this time. And often something happens that makes me go back and then usually the distance from it enables me to see what direction it wants to take. But there are a couple of older short stories I probably won’t go back to. Sometimes you really do have to let go. But if that inner part of you says this is a great premise, worth fighting for, go back and you might be amazed what happens. The trick is being discerning enough to know something won’t work and time to say bye-bye and knowing when it has that extra something that will get it noticed but either you are not ready to write it or it needs time to settle. And again I truly believe that writer’s instinct will develop the more you write and you will just know. I know I Am Wolf, my feral child novel, has something. I sense it. But I also knew it wasn’t holding together as it should, so when my agent told me what I knew, it proved my instincts were correct. I won’t abandon it, I will allow it to sit and I know when I do come back to it I will find a way to fix it.I just know it is a story that needs to be told. I just need a way to make the reader connect to Amy. She needs time in rehab and then I will go back to her. Self-doubt has crept in recently with Isle of Pelicans as I still fear the plot isn’t quite there and has challenged me the whole way. So I want to get this draft down (that is always a good feeling) so I can rest it and work on something new now and then come back to it. But I will come back to this one. What helped me last week deal with doubt was writing a completely new short story that refueled by obsession with writing and it worked. If you haven’t written a short for a while you have this crazy notion you have forgotten how. I know it sounds insane. So now I feel better and the story has been subbed. Allow stories time to rest and reexamine, but if in doubt write something new. And if it really isn’t working, know when to let go. Nothing is wasted because it’s all part of a long but rewarding process and patience is essential for a writer. But don’t keep starting one thing and then abandoning it for another or you won’t finish anything. If you get to that stage, take a complete break and don’t write anything for a short time. I don’t tend to do that, but I do know there are times when the words come and the stories work and other times when they don’t. IT’S NORMAL! Well as normal as life can be for those of us who live inside our own heads! Whatever you do — don’t give up! Happy Christmas from The Jet-Set! 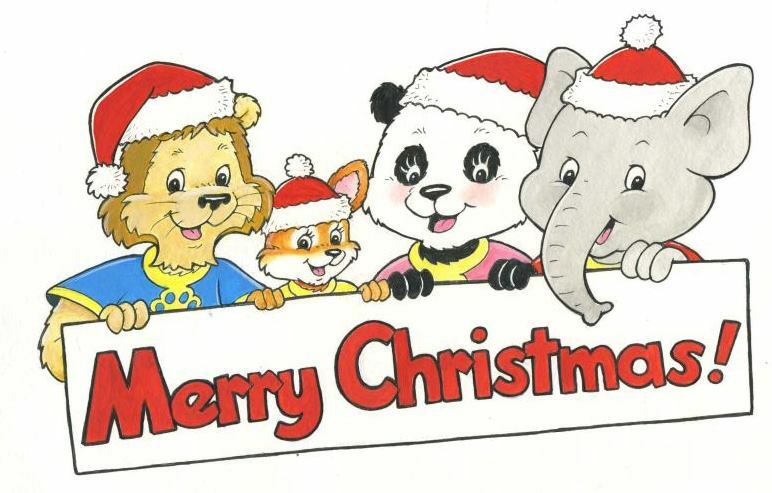 Christmas has always been my favourite time of year and it seems to have taken ages to come this year. I guess with all the excitement of the book launch I already felt as if I’d had Christmas! It’s been a whirlwind of busyness and now finally after working my little socks off I sent some work off and can sit back and relax for a few days with the family. I see Christmas and New Year as a time to restore the default settings. The same way I have a day every week when the house is cleaned and the messiness of the week is restored to its rightful place to welcome in a new week, and perhaps the same at the end of the month, but paying myself too so finances are restored. And so the big one is the end of the year — when we all take stock and I get out my new journal and look at my list of goals. I love the pages in a new diary and the look of a new calendar. I like to write what I have achieved as if I have. It’s something I leaned from The Secret. I wrote a press release announcing my success in finding a publisher long before it came true and I was able to use it! Now the focus is bestseller, but that’s where word of mouth has to come in and where I need all of you! For the last few years I have told myself soon — soon someone will want to publish my novel and it finally happened. And what a year 2013 has been — in every sense. And it started right at the beginning of 2013, early January when I had a message on my answer-phone from Parthian Books asking me if my novel was still available. Then it was the waiting game. March 11th was the day I started to dance and have not stopped. It was the day they said we love it and we want to publish it! The very words I had on my wall on one of my positive affirmations. It was not so long after that I learned about being on the short list for the Commonwealth and then WINNING the Bath Short Story award. This year I have also been published in three collections as well as having one of my stories in a literary journal. It will be a hard year to beat, but I’m gonna try. Oh yes. Of course you can’t expect that every year and I know it will be business as usual when I try to find an agent and a publisher for the next one — but onwards I go. Always believe. Always do what you love, and always celebrate every success, no matter how small. BUT dream BIG. And I do. This year has seen much sadness in the world, but then what year has not? And Christmas is also a time that reminds of me the dawn chorus — when we have a roll call and remember those who did not make it this year and those we have lost in the past. So for us there will be tinges of sadness, but in all of that you must make sure there are plenty of places for the light to get in. People live in unrest and war and every day can be a struggle so I am so so so grateful for the life I have. I mean this morning the only thing to irk was a 2-star review, and while my writing is my world, in the great scheme of things, what is that but a blip, right? I am so thrilled with the response from my novel. I knew the run of 5 stars would not run forever but it interested me this morning to see someone say they thought Lydia was the most boring character ever and had far too much padding so they glossed over a lot of her parts. Then they missed the real crux of the story I guess. But we all have different tastes and you can’t please ’em all. I will accept her opinion with grace. Of course Lydia to just about everyone else is the character they truly loved and couldn’t wait to get back to and the reason we return to her at the end. But if you don’t like books that err on the literary side for depth of character, then I accept opinion is opinion. At least she bought the book. In the great scheme of things this is what you have to expect in the arts — so long as people don’t think it’s badly written as that would hurt — and for what it’s worth, it’s not. Honest. So I went to a lovely carol service last night at the church and I think this is the first Christmas in a long time when I have thought about the real meaning. I’m not religious. I am spiritual, however, and while I find it hard to believe in what I can’t see, I think like so many of us, I want to. And I have to say I really enjoyed the service. No matter what you believe, a time to look back and be THANKFUL and to gather close to those you love (and think about those you’ve lost) can be no bad thing, right? And it was all by candlelight. So I look back at this amazing year with a HUGE smile and my heart does that flippy thing as I look forward to 2014 and write down what will come true then. It will be a GREAT year. BRING. IT. ON. I will be having a rest from blogging for a week or so to just enjoy ‘being’ and relaxing with the family. So I want to wish everyone who has stuck by me, read my ramblings and listened to me talk endlessly about bookish things and indulged in some glorious self-promo — a truly WONDERFUL Christmas and a SUCCESSFUL 2014, in every sense. This was a great year. You wait till you see what next year brings! The aim of a truly great novel is really to get into your reader’s head. To ‘possess it’ for a while in the best possible sense. Or at least that’s my aim when I write anything. I just love it when I can disappear into the pages of a book and lose myself for a while. People ask me, as an editor, and a writer, if I find it hard with some books to turn that off and find myself reading the book as if I’m critiquing and the short answer to that is yes — in a way. I hate it though as I think well look this is published, edited etc, so who do I think I am? But I guess it goes with the job. But then again if I can truly lose myself in a book then I see that as a measure of how great it really is. And to effect this I truly believe the reader has to be part of the story. I have found myself working on a lot of manuscripts of late where I say SHOW it, FILM THE SCENE. What I mean is don’t tell me how a character feels or why they said something. Or even how what someone says makes them feel, SHOW it. What is so often lacking, or so it seems to me, is SUBTEXT. To complete the whole getting inside a character’s head and that total immersion I think you need, the reader has to be active not passive to the process. By this I mean they have to be watching events unfold, part of those events, rooting for the characters and trying to second-guess. It’s vital they have to work to resolve things, pick at the threads, try to work out what’s really happening in the story. If you tell them too much it becomes a much more passive process for the reader.Subtext, body language, things SHOWN allow the reader to think, to become part of solving the dilemma the novel poses and without that and too much telling, the reader becomes of a passive bystander and so the story lacks the WOW factor. This for me is why you have to SHOW and not TELL. So, I had a busy working weekend although I did have a lovely mean in Chester with my partner in crime from Bridge House on Saturday but of course we talked writing and books! What else! I am so looking forward to next Saturday when we have the official launch party for Wild n Free Too when I get to meet all the talented children and their families! 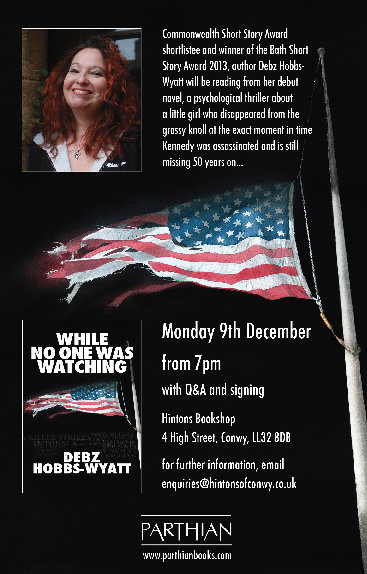 Tonight remember I am signing at Hintons Bookshop in Conwy and I so hope people show up! If you let me loose in a bookshop with no guests but lots of books to look at I might spend too much money! So, best write but one final plug for the event tonight. Hope to see some of you there! And remember — my novel is still 99p on Kindle and made it into the top 500 Kindle books (now at 344!) and is 77 in Crime and Mystery this morning! DOWNLOAD IT! Tell all your friends!!! Thank you! As you will know I have covered many subjects here from the nitty-gritty of writing technique to publishing, reading, MAs, books, authors etc, etc. And a few things about something different. Lately it seems like a bit of an ego trip (sorry!) shouting about my novel but it’s proof that getting it published might be the hard part but writers also have to sell books, especially with the smaller presses. When I met Sarah Banham last week before the Saint FM interview she asked me what I wanted from this book and perhaps somewhat flippantly I told her ‘I want it to be a bestseller.’ I think it took her aback and maybe me too! At the end of the day it’s about being the best writer I can be and it has always been about the writing. I wanted this book to be recognised as worthy of publication and then my hope is people will get it and love it — so far so good. But very few become bestsellers! So does it have to be one? Well it would be nice. And I hope somehow it does spread beyond my family and friends and reach a much wider audience but I guess we have to wait and see. I will use The Secret and imagine it does make it. And weirdly to some it’s not a focus on getting rich (I honestly don’t care about that) it’s about the book being read far and wide, at airports and on trains. Really I just want my characters to meet as many people as possible. Is that weird, maybe but hey, that’s how I feel. Sales so far have not been bad for a small press but now it’s about getting that message further. So I appreciate all those who have helped with that and written those great reviews. What I mustn’t do is get hung up on it not being a bestseller! I was thinking that last night. Very few books are so we need to focus on what this is really about, good writing, total immersion in process and loving it. And I do. The success can be measured in many ways and I feel successful for sure. I kind of feel guilty with all the book things like last week that the emphasis was more on talking about me and my work and less on the writing, but then I realised that is part of the job too and a long time coming so perhaps no apology should be made for indulging in that, for a while? This week is more normal with writing and working, lots of editing and critiquing this side and the other side of Christmas all lined up, which feels great. So off I go. 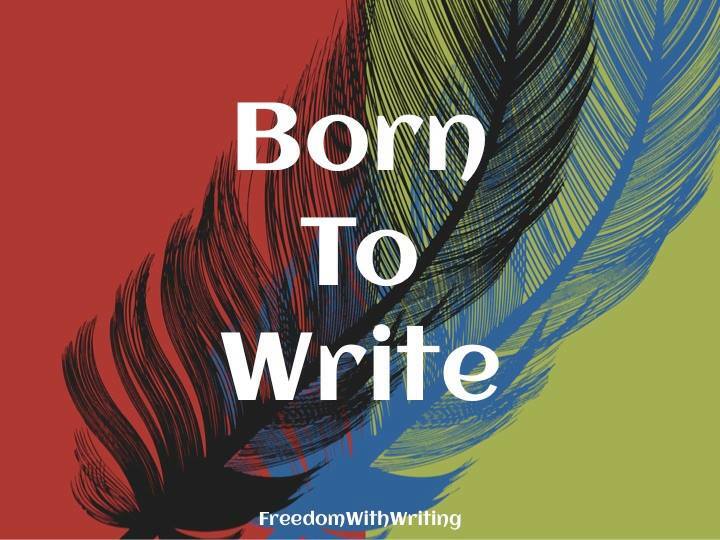 I will return to more blogging about writing technique as well … I think we need more of that again as I knuckle down and just write! I still might publish an eBook about writing … pondering it at the moment. 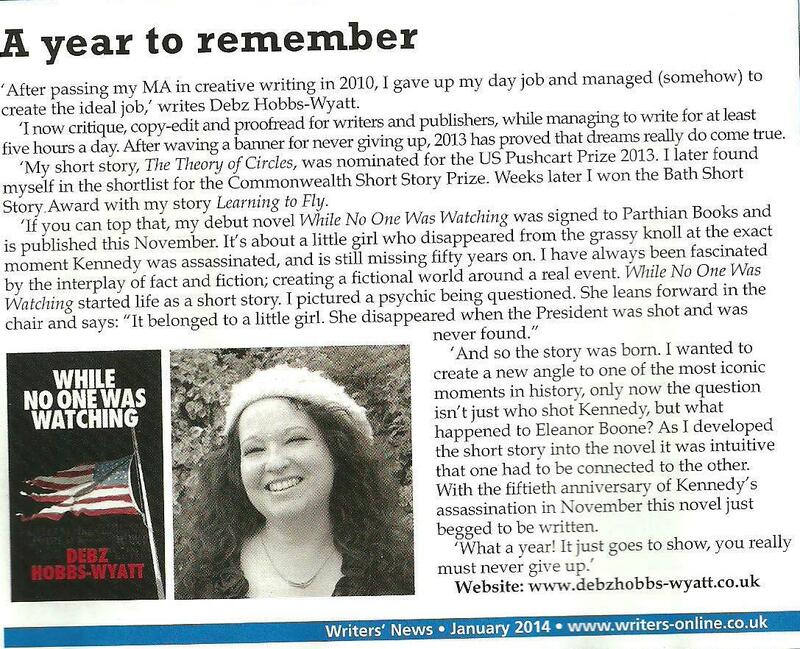 But egotist that I am I will share the piece in this month’s Writing Magazine for those who might have missed it! Oh and the paperback is on offer on Amazon this week and the Kindle version is 99p! Do get it while it’s HOT! PS I have had lots of lovely writers on my blog, so I hope to be on some of their blogs soon! Anyone else want me on, send me some questions! Good being a writer, in it?